Sri Chaitanya Saraswat Maha-Sankirttan !!!! Pictures and web-pages by Krishnendrani D.D. 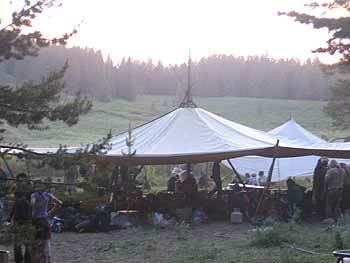 From June 29 to July 6 devotees from California, Oregon and abroad came together to deliver a powerful dose of Srila Gurudeva’s mercy to literally tens of thousands of participants in the 2006 National Rainbow Gathering. The Simply Wonderful Kitchen on the first day. 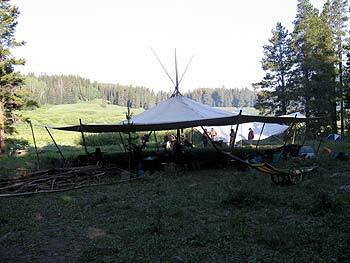 It took hours of movement to erect the tepees and tents in the middle of this Colorado aspen and fir forest. Our large fire-pit that was constructed by Damien. 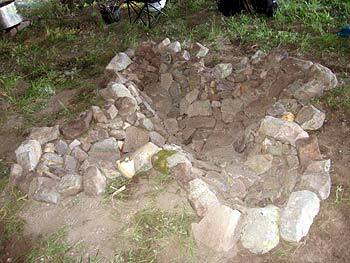 Practically a work of art, this fire-pit was sculpted out of the rocks that were present at our camp. The campsite on the second day is already a buzz of activity. 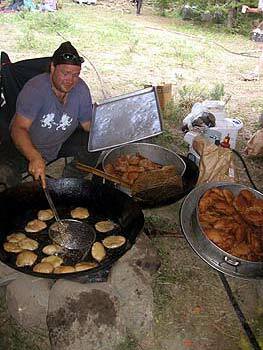 The kitchen that was brought into the middle of the forest would continue to serve over 4,000 people each day. 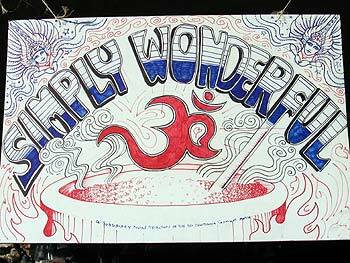 Simply Wonderful Kitchen ki Jai! 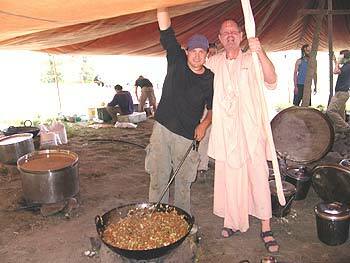 Nitya Hari Prabhu and Sripad Bhakti Vigraha Nyasi Maharaj with one of the many giant woks of Prasadam. Devananda Prabhu busy cooking over 3000 pooris. Held this year in a national forest preserve about thirty miles north of Steamboat Springs, Colorado, the festival attracted between twenty and twenty-five thousand hearty souls. They carried supplies for miles over rough hiking trails to their respective camping sites, situated in forested hills overlooking several lush mountain meadows 9,000 feet above sea-level.